The Qur'an began to be revealed on the Night of Power during the month of Ramadan. Revelation to the Prophet Muhammad continued in parts according to need during various periods of time, and this process lasted approximately 23 years. Due to its being the month in which the Holy Quran was first revealed, the month of Ramadan has a special place in the lives of Muslims. The month of Ramadan is the anniversary of the Quran's first revelation or, in other words, the anniversary of the beginning of the call to Islam. As a symbol of the Quran's gauging everything, this night was called the "Night of Power." Due to its being the night the Quran was first revealed, that night was called the "Night of Power" in order to convey to people the value and honor of that night, that month and the Prophet. Because the life of believers was made more bounteous and valuable with the Quran, the night it was first revealed is called the "Night of Power." Due to the Qur'anic revelation continuing for years and its commandments being permanent until Judgment Day, it was preordained to be revealed in the month of Ramadan. The Prophet recited the Quran slowly word-by-word both during prayer and outside of prayer. He united with the word of Allah while reciting it. He made an effort to address it, and he contemplated for long periods on its meaning. Today the tradition of muqabala (recitation of the Quran) during the month of Ramadan in Islamic countries is a result of the "arza sunnah." The Prophet recited the Quran slowly word-by-word both during prayer and outside of prayer. (8) He united with the word of Allah while reciting it. He made an effort to address it, and he contemplated for long periods on its meaning. This verse praises not only those who read the Quran, but who at the same time make good deeds as necessary, and it informs that they will be rewarded by Allah. Reading the word of Allah, but not living its commands has no value in God's eyes. Pointing out that those who continue to read the Quran become friends with it and that it will intercede for them on Doomsday, the Prophet recommends that we illuminate our worldly homes and the home of our hearts with its light and decorate them with its beauty. The Qur'an is the word of Allah. One who reads the Qur'an is not reading just an ordinary text. He is pronouncing divine speech with its words and meanings. 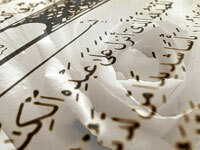 Consequently, when a servant is reading it, he is conversing with his Lord. What a believer must do for Him is to realize that he is confronted with his Creator's words and to perform whatever duties this requires. It is particularly meaningful to pay attention to the month and night the Qur'an was first revealed. Giving importance to the Qur'an by benefiting the month of Ramadan in this respect - by reading, listening, and following its commands - and thus attaining righteousness is a matter every believer should be careful about and it is the most virtuous act of worship. 4. Bukhari, Fazailu´l-Qur´an, 7; Muslim Fazailu´s Sahaba, 98-99. 5. Muslim, Fazailu´s Sahaba, 98. 6. Bukhari, Fazailu´l-Qur´an, 7; Muslim Fazailu´s Sahaba, 98-99. 7. Abdulbaki Turan, Arza, DIA, Istanbul 1999, III, 446/447. 9. Ibn-i Mace , Iqamati´s-salawat, 179. 14. Muslim, Salatu´l-musafirin,,244; Bukhari,Tawhid, 52. Please type '764' into this field.